Upon leaving school, young Terry Lewis started work as a shop assistant. However, he was also an enthusiastic singer and his strikingly good looks helped him make the transition in this sphere from part-time amateur to full professional. With his musical career on a proper footing Terry decided to change his name to Mark Lewis in order to lessen the confusion with American comedian Jerry Lewis. His manager suggested Wynter sounded more commercial and the complete name change was later made official by deed poll. Mark's rendition of the teenage ballads of the era proved popular- particularly with female record buyers- and he managed to reach the UK top twenty with his first release; 'Image Of A Girl' on Decca. He followed this with the Lionel Bart penned 'Kickin' Up The Leaves' and a stream of further minor hits and misses- punctuated by a change to the Pye label during mid-1962. His first release for the new company was a cover version of the US Jimmy Clanton release 'Venus In Blue Jeans' and, in common with his other releases on Pye, benefited from its arrangement by Tony Hatch. This song is now easily his most memorable hit and was sufficiently popular to earn him a UK #4 chart spot, whereas the Clanton original went almost unnoticed in Britain. The EP shown on the right was the first issued for Mark following his move to the Pye label during 1962. This EP was much more successful than a confusingly similarly named EP from Decca, and is now somewhat easier to find. In any event, it contains a nice selection of material not found on his singles including the song "I'm A Lucky Guy", which, as the notes on the sleeve point out, Mark wrote himself. 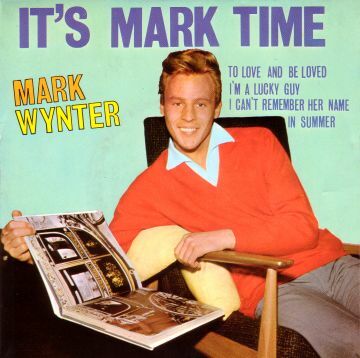 The popularity of Mark Wynter's light ballad style survived the onset of the beat boom and kept him in hits up until the spring of 1964. However, by the late 1960s his record sales had waned and he inevitably drifted into the cabaret scene. This did not last long as Mark had ambitions to act, and by 1967 he had already started a parallel career in repertory. By the end of the 1960s the transition to actor was complete. In fact Mark's show business life has remarkable similarities to that of his peer, Adam Faith. However, unlike Adam, Mark takes advantage of his good singing voice in musical shows whenever the opportunity arises in his stage career which is still going strong. See upper list for UK singles releases. Decca DFE6674 1960 "Mark Time"
Pye NEP24176 1963 "It's Mark Time"